In 2010, the Chief Executive Officer of Dykema appointed Ms. Naasko as Diversity Counsel to the Diversity Committee. In this role, she has been tasked to assist in the implementation of the overall diversity initiatives of the Firm, which include wide-ranging activities from recruiting, retention, mentoring and business development for diverse attorneys of the Firm. 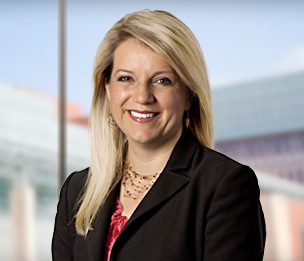 From 1998 until 2002, Ms. Naasko was an associate with the Firm's Corporate Bankruptcy Group. The Firm accepts referrals for pro bono services from our partners such as law school clinics, legal aid but not directly from individuals. If you are looking for an attorney with a criminal matter, this firm cannot assist you directly. You should call the State Bar in your state for a referral. If you are looking for an attorney for a civil matter (family law, immigration, contract dispute) you should call legal aid in your community. Free civil legal aid is organized and funded by the county in which you live. www.lawhelp.org can assist you find the correct agency. Prior to returning to Dykema, Ms. Naasko was a staff attorney at the Women's Survival Center of Oakland County, where she ran a pro se divorce clinic and represented domestic violence survivors in family law matters. Transforming Your Pro Bono Program Back to Basics, Pro Bono Institute Annual Conference, Washington, D.C.
"Has your client been SLAPP-ed?" "Does State Law Create Personal Liability for a Troubled Company's Unpaid Wages?" "Ford, Dykema, and CLR Team Up"